Omdat het radio-optreden veel te leuk uitpakte om het bij een eenmalig gebeuren te laten, zijn de Stroatklinkers – toen nog zonder naam – daarmee door gegaan. Omdat ze tijdens die uitzending nog geen naam hadden, werd er ter plekke door presentator Okkie Smit bedacht, dat de luisteraars een suggestie konden insturen. Uiteindelijk is toch gekozen voor de zelfbedachte Groningse naam “de Stroatklinkers”. Zo vanaf het jaar 2000 zijn de Stroatklinkers overgestapt van 10 (!) microfoons naar 1 bijzondere microfoon. Hiermee ging de statische podiumact overboord. Zo ontstond er een levendige podiumact met veel hilariteit als de muzikanten zich verdringen om bij de microfoon te komen. De Stroatklinkers hebben tot nu toe zes cd’s gemaakt, (zie knopje “cd’s”). De laatste cd, uitgebracht in december 2015, is de jubileum cd, met 25 liedjes. De helft daarvan zijn Engelstalig, een langgekoesterde wens. 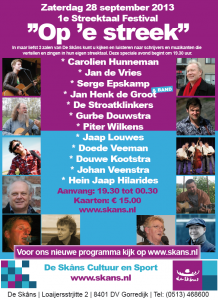 The Stroatklinkers are an acoustic Bluegrass/ folk band from the county of Groningen, in the North East part of the Netherlands that was formed in September 1990. Five musicians, from different musical backgrounds, played together for the first time, as a guest band during a live radio broadcast at a local TV and Radio station. Bob Heidema (the guitar player and contact person for the band) already had a few songs, which were written in the local dialect, Gronings, and they performed these songs in the studio with enormous enthusiasm. Coupled with such a positive response from the listeners, the five decided to continue playing together, but then had to decide on a name. Bob, Frank and Henk were from the Gronings folk band “Snoarenspul “. Adrian, Harry and Bob played previously in the Dutch bluegrass band “Grass Grow “. During the Broadcast, the nameless band, with the help of presenter Okkie Smit , made a plea to the listeners to send in suggestions for a name for the newly formed band, and one name that stuck was ‘Bobtails’ . Ultimately, though they decided on the self-penned name ‘De StroatklinkerS ’ , because they started their musical career, playing at Street festivals etc. The name literally translates to “Street sounds”, and plus the fact that the bricks used in laying local roads, are known as klinkers. And ‘Stroat’ is the local name for street!!! With the exception of Adrian, the line-up has remained the same until 2013. In the period from 1998 to 2006, Adrian returned home to his native England and continued building fine musical instruments for top class musicians, and with his English band toured extensively the Bluegrass areasof the United States. But he returned to record his parts on 3 CD’s ( Stroatje om, Knap stoaltje and Klinkkloar). During this period he was replaced by a young female, Johanna Hamstra (banjohanna), an excellent Banjo player and singer, from the neighbouring county Friesland. In January 2007 Adrian came back to the Netherlands, and took back his old spot, now vacated again by Johanna. In August 2013, the original Bass player, Frank, decided the time had come to start a new musical adventure. The band though has found an excellent replacement, in the form of ex bass player with the legendary Dutch rock band ‘Kayak’, Bert Veldkamp. In the year 2000, De Stroatklinkers switched from ten microphones to one. The static stage act was now a thing of the past! It has now been replaced by a lively stage show, with humour and fun as the musicians jostle to get to the microphone, and all without compromising the excellent sound quality. The band has changed over the years from its ‘busking ’origins, of playing on the streets, to performing from intimate coffee concerts, to large audiences in theatres around the North of the Netherlands, and performing across Europe and beyond. In 2000, they performed at a festival in Lithuania, for approx. 40,000 Country music fans!!! In December 2015, to mark their 25 year anniversary, their long awaited double CD was released. This is their 7th recording project on the Strictly Country label, and for the first time, (due to popular demand), includes their most requested songs in English, in addition to their native Dutch dialect. This has given the band a new dimension, and should surely help them gain recognition outside of the Dutch borders. Keep an eye on their busy schedule, for they might be playing somewhere near you….. come out and see them….soon.